Source Vapes has been a big contender in the wax pen game for a long time now. Back in the day they released the old elips-style vapes, some globe units and more recently the Orb series. The Nail is their most powerful concentrate vape to date, and runs on a 40W temperature control mod battery. Let’s check it out. The Source Nail is packaged in a hard shell & padded case that latches shut making it easy to take over to a friend’s place for some dabs. I really appreciate it when manufacturers include seriously heavy-duty cases like the one included with the Source Nail. This unit is an investment, and it’s nice to be able to protect that investment without having to purchase a case on your own. Having seen and used other portable e-nails (Hand-E Nail and Boost) I can say that the Source Nail is the most compact. 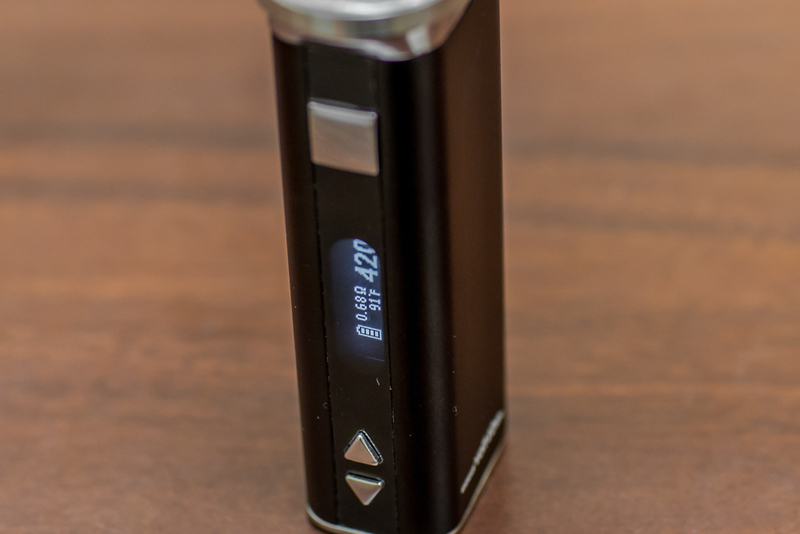 The mod battery is shorter in height and more contoured to fit in one’s hand. Plus the design of the atomizer is deeper than any similar units I know of, so you can dab more with less concern of making a mess. That also means you can vape more wax in one shot, which is a pretty popular thing among the “dabheads” out there. It seems like everyone is trying to best the guy before them with longer strands or bigger globs of concentrate being dabbed in one video. I’m not even mad, it’s impressive. There are three different atomizers or nails that come packaged in the Source Nail kit. Each one gives a slightly different experience and each one is recommended they be heated to different temperatures (more on that below). The first is a Grade 2 Titanium nail which is the material that dab nails really started being made out of. The old school setups required blow torches (until e-nails came around) to heat up and probably still aren’t necessarily the safest thing around. Out of the three nails included the titanium one is obviously the most durable option. The second one is a ceramic nail which is great for its capability to retain heat, so even after you’ve released the button you’re getting solid hits. It can take a little longer to get up to the right temp, but we’re only talking about a few seconds so it’s nothing crazy. And the third one is the quartz nail, my favorite for quick dabs since it is considerably the fastest to reach the sweet spot. It is also the most fragile of the three nails, at least from my experience. Perhaps I’m just a klutz but I do suggest being more careful with the quartz nail. 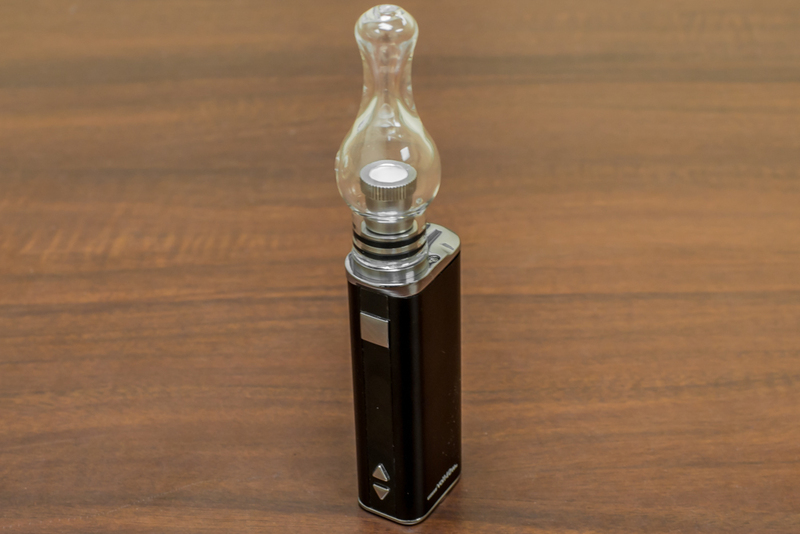 The bubbler attachment is pretty similar to the other ones you see on the handheld e-nails available right now, it’s a little side-arm design that fits around the atomizer attachment. I definitely like filtering through water (born and raised on bongs) but the amount of water that you can actually fill it with is pretty minimal before you begin drinking it. However that doesn’t mean it is completely ineffective, the vapor is cooler than taking a dry hit from a wax pen. When hitting temperatures over 600 degrees that extra coolness makes a pretty big impact on your throat. Fill the bubbler through the hole of the mouthpiece, it doesn’t take much in order to get the proper level. Roughly a quarter of the way full is the ideal spot before it’s too much water and you’re sipping from the darn thing. If you find that it’s been overfilled or some water has drained down into the bottom chamber, just tip the bubbler and it will drain out the hole on the side. 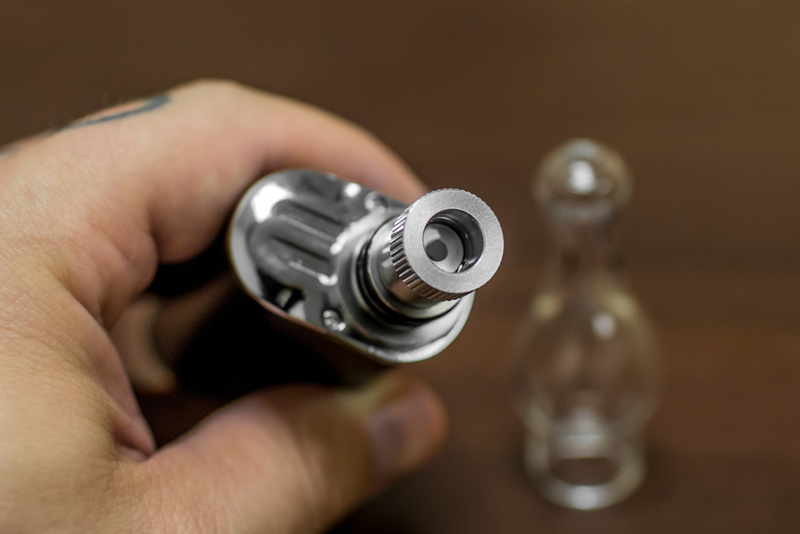 If necessary wipe any excess water off and slip it back onto the atomizer attachment then thread it onto the battery. The size of the battery concerned me a little when I went to set the unit down with the bubbler attached. I quickly discovered that if you rotate the bubbler so the mouthpiece is on the opposite side from the button that the weight of it balances out and keeps it rather stable. I’ve seen and used e-nails that have weighted bases that attach to the bottom but the Source Nail does not have such a thing. No worries though, you have to hold the button down in order to keep the Nail heating, so you’ll probably have the battery in your hand and not on a surface. It features a digital temperature display that can be set to any degree between 200° and 700° or if you prefer operating it in wattage, that ranges from 5 watts up to 40. Since I’m not very familiar with mod vapes and e-juice, I stuck with the temperature control option for pretty much all of my testing with just a little dabbling in the variable wattage mode. I find that being able to see the exact temp is incredibly helpful for dialing in the sweet spot. So now the battery is in the Temperature Control mode and you can select the temp at this time. The right arrow increases the setting and the left will take it back down. Holding the button down will rapid fire through the temps but a single click changes it by a single degree at a time. If you prefer the variable wattage mode just press the button thrice rapidly to reach the Source volt 40w Main Menu. The first thing you’ll see is “Atomizer,” press the power button to select it. You’ll have three options on the following menu, choose“Normal” and once again click the power button. This will put the battery into Variable Wattage mode which displays wattage instead of the temperature. Increase or decrease the wattage with the right and left arrows. The Source Nail includes a quartz dab tool with a built in cap. Warning, if you are going to dab a rather sticky wax, go slow because you might just break it. One of the first few times I let a friend use the darn thing he broke it… seriously. Quite honestly though it isn’t the end of the world, I have so many metal tools lying around from other vapes that I just swapped one of those in (I still cap it with the quartz lid (it looks like a game board piece now)). If for some reason you don’t have a metal tool already, you can find one online for a few bucks no problem. As discussed earlier, the Source Nail includes three different types of atomizers right in the box. I picked up a large chunk of shatter and spent a whole Saturday (if I remember correctly) testing out each one extensively to determine the best method to get optimal flavor and performance. Since Source Vapes website has some guidelines for their atomizers, I started with their recommended warm up times and from there blaze my own trails… both figuratively and literally. I began my dabbing experimentation with the titanium nail, I figured that I could really crank the temp up and put it through the ringer. In all of my research before using the Source Nail, I couldn’t find very detailed instructions on the exact process of dabbing with it. Do I heat through a couple of times and then dab the wax? Or do I heat it and dab will the button is being held down? Without any clear-cut explanation available, I realized it was going to be on me to determine what approach will generate the most substantial clouds. With everything assembled and the temp set to 700° with the high power choice selected, I starting holding the button down and around 8 seconds in the temp was over 550° when I released it. I quickly pressed it again so the temp would continue to increase and during this hold I dabbed my wax to the atomizer. The shatter vaped instantly so I capped it to get a bigger hit. After drawing for a few seconds, I exhaled a large breath of vapor. I started coughing and immediately realized how intense the power of the Source Nail really is. Since the first one got me pretty hard, I waited a while before getting back at it… all in the name of science of course. For this dab I decided to heat the nail through the full 15 second cycle then dab it up. The Nail hit 700° before the auto cut-off kicked in and I paused for a few seconds to allow a slight cool before touching the concentrate to the surface (titanium cools fast so it doesn’t take long). Rapid vapor production straight to the dome! Though it did hit hard, I found that the method of holding the button continued to produce vapor longer. Also when I rotated the dab tool around in a circular fashion, it catches some concentrate along the inside edge which makes for bigger hits. I moved on to the ceramic nail option for the next series of glob assessment. Knowing that ceramic takes longer to heat, I held the power button down through a full cycle right off the bat. One full 15 second cycle through and I promptly held the button again to maintain the heat on and dabbed during this cycle. The dab wasn’t huge at first but as I held the button down the ceramic continued to heat and maintain the temp. I capped it and kept tipping it open every few seconds to clear it and then allow it to build up vapor again. Ceramic retains heat very well so I held the button for 8 seconds and released since it didn’t seem to require a full cycle to reach temp. I paused briefly before dabbing some more and found it to be right where I wanted it, the clouds were thick but smooth through the bubbler attachment. The ceramic was a nice experience, it hit very well for both dabs. After the second one I set it down to cool off in order to un-thread the atomizer to swap it out. The last nail up in my wax evaluation was the quartz attachment, one that heats up pretty fast. For the first run I decided my technique would be to hold for a full cycle but to begin dabbing at 6 seconds into heating. Though it was less than halfway through the 15 seconds, the quartz was hot enough to produce a sizable cloud. After just one hit I thought that this might be my favorite of the atomizers. The second hit was dabbed once a full 15 second cycle was run through, this one caused me to cough for a while. Might have been the largest cloud produced out of all the dabs, though each nail is going to perform well. Although I prefer the Temperature Control mode, this review wouldn’t be complete unless I tried my hand at the variable wattage setting. If you’ve used a mod in the past, you might be a bit more familiar with variable wattage settings, but otherwise I think most people will end up using the Source Nail in TC mode. This setting is a little confusing because the temperature that is displayed just stays around 86° and doesn’t increase while you hold the button. There is no question that the nail is heating very swiftly, I was using the ceramic nail and could see it glow red within a few seconds. According to Source Vapes site, each of the three have a different recommended wattage range in which they should be operated within. So if you run the titanium nail on 25 watts for roughly 10 seconds the temp will be around 700° Fahrenheit. This is their guidelines and to ensure the longevity of the atomizers, do stay under the suggested wattage or you might find them burning out at an unusually quick rate. I operated the ceramic nail based on what Source advises and at 40w it did dab very efficiently. Although I like the temperature mode a little more, I can see why they offer both settings and give the user complete control over their experience. Another method that I tried was putting some wax into the atomizer before I even began heating it up. Quite honestly the first time I took the Source Nail out of the box I must have already been kind of stony because I just dropped some in without even thinking. Yeah, I know that it is called the Nail but I am so used to loading up a pen that defaulted to that technique. Although it’s not truly designed with the intention of filling it then heating, it does work just fine. Setting the temperature lower provides the most consistent hits and flavor. I started around 400° and worked up to about 500° over a few different sessions, my favorite temp for the “fill then heat” method was 475° but yours might be lower or higher… play around to find what makes you happy. 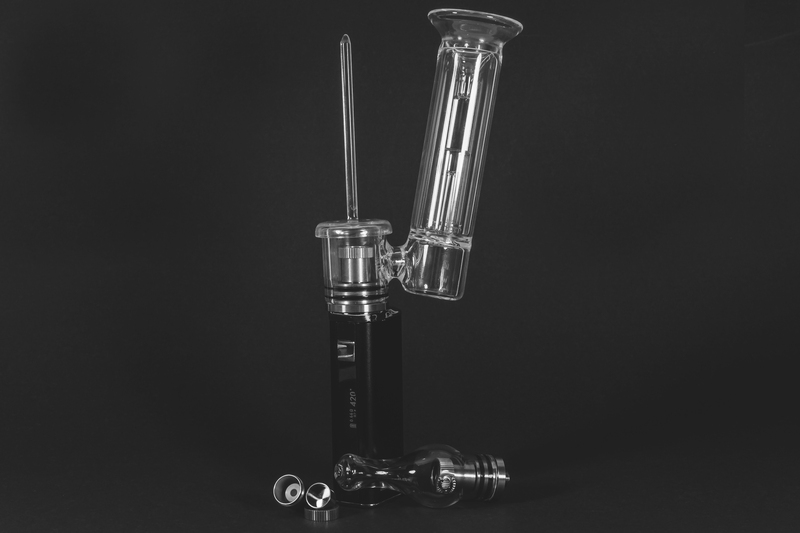 Along with the bubbler the Source Nail includes a glass globe attachment with a carb on the side. 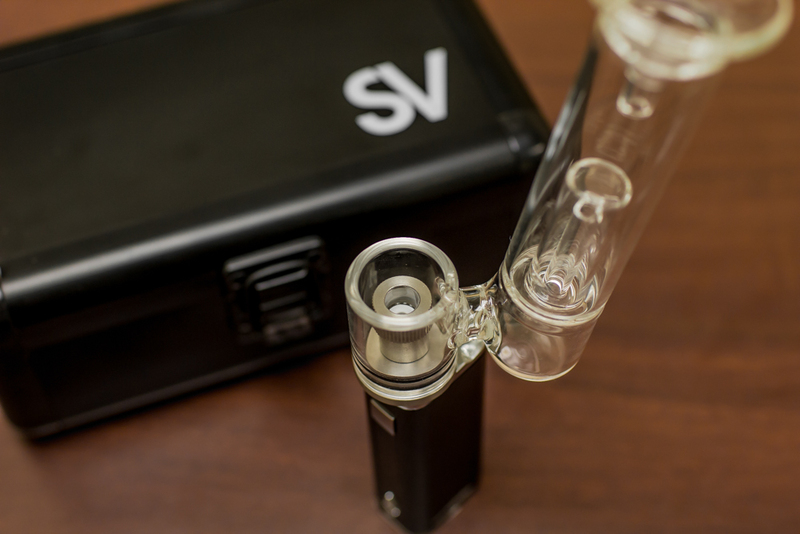 This piece is specifically designed to be filled with wax and then heated, while using the same atomizer attachments. Glass globes have been popular for quite a while, most vape pens these days either include or have them available. Something about being able to see the vapor, people like that, makes ‘em feel like they have gotten a bigger hit. And with this globe, since it has a carb the clouds can be HUGE! When vaping in this manner, hold the button down for about 7 to 9 seconds before you begin inhaling. It may seem like vapor is being wasted as it builds up, but the overall result will be smoother. So there are quite a few parts included with the Source Nail and you might be thinking, how the heck do I clean all this stuff? Well, as with any vaporizer that using concentrates, your number one ally in the fight to keep things spotless is isopropyl alcohol. I haven’t found anything as effective and it washes away easily so you don’t experience any strange flavors next time you vape. Stock up on it too because it can be pretty frustrating when you want to go full clean mode but you only have a few drops of iso left… worst case. I start with the bubbler attachment first by running it under hot water, pro-tip if you use rubber kitchen gloves the water doesn’t burn your hands. After a nice rinse to assist in weakening any built up resin, I pour the isopropyl alcohol down the mouthpiece of the bubbler. Go very slow because it isn’t the largest hole (we’re still talking about vaporizers… I swear), if you pour too fast it will end up flowing over the edge and not down into the bubbler. Put one finger over the mouthpiece opening and the other down where the vapor travels up through and shake the living hell out of it, just don’t let it go flying out of your hands… trust me, it can happen to you. Continue shaking and baking until the glass has reached a level of clean you are satisfied with… which means it better shine baby! I want to be able to see my reflection in it afterwards, because I’m vain like that. Set the bubbler aside and get a paper towel damp with isopropyl to wipe down the quartz dab tool/carb cap. I find that it is more effective than just soaking it and cuts down your overall cleaning time. The dab tool is actually something I clean more often that all of the parts, I don’t like dipping a dirty tool into my container of wax. The beauty of the atomizers that come with the Source Nail is the fact that they can be unthreaded and the heating dishes fully removed. I toss the little ring and the dish into a cup of isopropyl and let them both soak. If you want to clean all three at the same time be sure to mark the atomizer body itself so you can put the correct dish back into the corresponding atomizer. Source states that each atomizer has a different temperature and wattage range based on the materials they are made from. After ample soaking time, use a cloth or paper towel to ensure the pieces are completely dry prior to placing the cup back into the atomizer body and threading the ring back on. 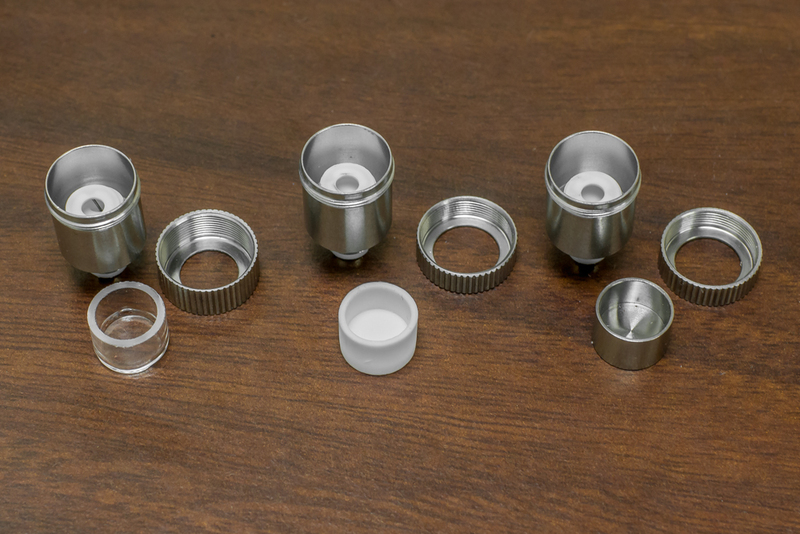 Spot clean the outer metal atomizer body with the isopropyl and the cleaning is done. Dabbing has definitely taken the world by storm and I am not talking about the dance that Cam Newton does (no question that is popular though). As a result there are a plethora of portable e-nails already on the market and literally new ones popping up daily… everyone out there wants a piece of the wax pie. So with all of these options to choose from, how can anyone make a decision? It’s not easy but let’s go over what makes the Source Nail a better or perhaps worse portable e-nail than others. I want to talk first about a design that I am seeing replicated left and right, you might know it as the Pulsar Hand-E Nail, Dr. Dabber Boost, Dababdo, etc. as these are all near exact clones of each other. It is hard to say which one came first, but I am sure that each company would argue it was them and they have the exclusive patent. Regardless of who was first to the market, this general design has a major flaw in my opinion, they only offer one or two temperature settings. As a result the Source Nail really knocks it out of the park in the temp category. What I do like with these other vapes is the metal & magnetic tool that they all include, it’s a step above the quartz tool. Being a big fan of artsy stuff though, I am always shopping for cool/unique dab tools and rarely use the cheap ones that come with vapes. Along with the nicer dab tool, these Pulsar Hand-E Nail style units all run on a removable 18650 Li-ion battery (like what you find with a lot of mod vapes). This design allows for quick swaps of batteries without having to wait for anything to charge up. That being said I have yet to have an instance with my Source Nail where the battery dies mid-use. The charge level is displayed on the digital screen so you can easily be aware that it is time to plug it in. The Cloud V Electro is similar in look to the ones I just mentioned, however it is larger and more powerful than any of those. It has two temperature settings blue and red or 800° & 1000° respectively… that’s friggin’ hot!! Because it has this extra power, the battery is substantially larger than the other portable e-nails. With that considered though, I would say the Electro is the closest option to an actual desktop nail. When doing dabs with it I prefer to leave it on the table as opposed to holding it as I do with the Source Nail. The most archaic way to dab and probably still one of the most common is with a blowtorch. Obviously that means it is no longer an electronic nail, but it is still portable nonetheless so I thought to include it as an option. All you do here is heat up a nail (titanium, ceramic or quartz usually) with the torch and touch your wax to the heated surface, pretty straightforward. The Source Nail can heat in a quicker time at about 8 to 15 seconds to dab because the nail is smaller, a torch is hitting in about thirty or forty seconds. And when you do use the torch method there better be a can of butane somewhere on hand otherwise if it goes dries, you are out of luck. E-nails are no doubt the future and portable options are great for those who want to dab but not have to transport bottles of butane with them wherever they go. Dabs anywhere and anytime, who doesn’t like that?! In all seriousness the Source Nail has a lot of aspects about it that I consider make it the best portable e-nail on the market. 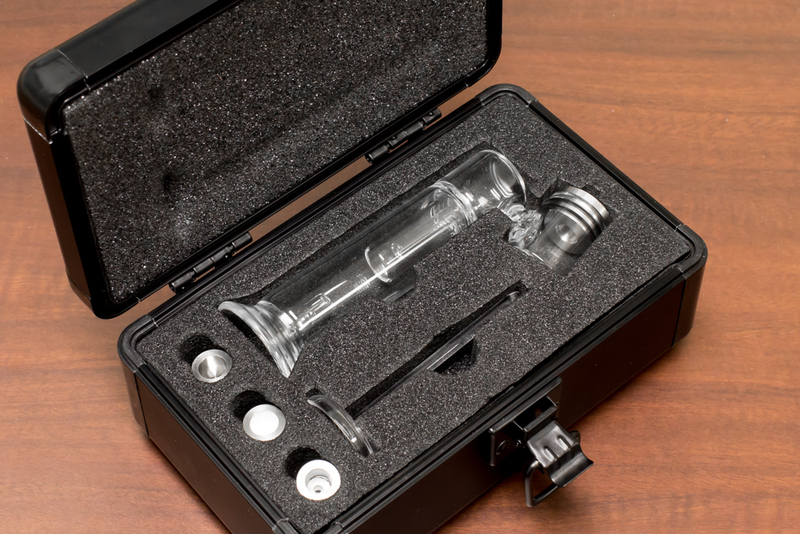 It comes packaged in a very nice hard case with three different atomizers, that’s some major dabbing options. On top of a nice selection, they are all incredibly easy to keep clean since they pop apart. And they all present a distinct experience when you dab. 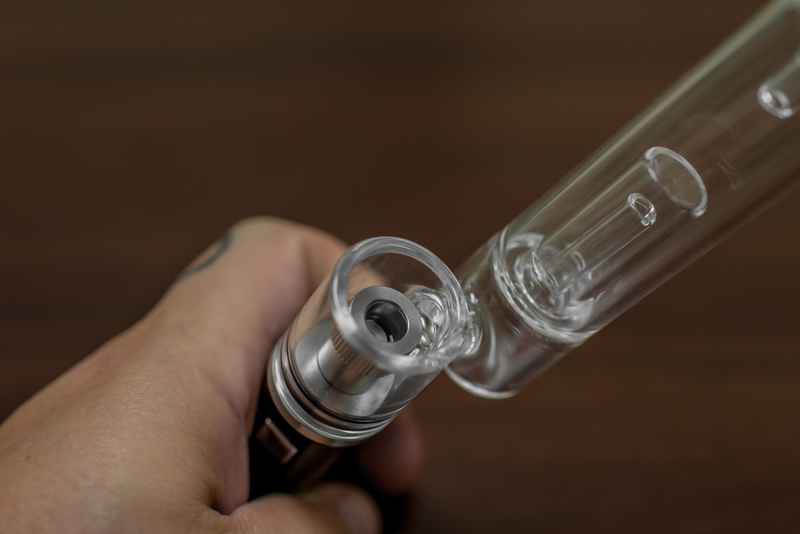 The included bubbler attachment is great for cooling down the vapor which you want since it is coming from a nail heated at over 500° Fahrenheit. Along with the additional carbed globe option, the Source Nail has you covered when it comes to concentrate vaporization. The full temperature control is ahead of the game when compared to other portable e-nails with preset options. And the size of the battery is second to none, it fits very comfortably in my hand so I can dab on and on. The one thing that really jumped out at me right away was the quartz tool, it just feels kind of cheap. There was actually a debate among my friend as to whether it was actually plastic… it’s not though. Another aspect was how much water the bubbler can hold, but at that point I do begin to feel like I am splitting hairs a little bit… it IS a portable e-nail after all. If I want a bubbler that can hold bucket loads of water, it probably won’t be that easy to transport. One downside to the unit itself is that you have to hold the button down to keep it heating. With some of the other portable e-nails available you just turn them on and they heat through a cycle, then shut off automatically. With the Source Nail, it’s really no the end of the world though because I never really found myself dabbing with it on the table, I always had it in my hand when hitting it. Which makes it easy to keep a finger on the button during the whole 15 second cycle. The Source Nail has become my go to dab rig, even when I’m at home. I like the convenience of being able to kick back on the couch and not have to worry about a cord knocking things off the table or a blowtorch burning down my house. The variety of included atomizers gives the Nail diverse performance and value to the product. Although the battery is not removable it doesn’t become an inconvenience and is a fine trade off for the complete temperature control. Some people want to run it at a higher setting while others specifically want lower temperature dabs. If I could suggest one portable dab rig to someone who wants to leave the blow torch behind, it would be the Source Nail. And remember… give a man a dab and he’ll stay high for a while, but teach a man to dab and he’ll stay high for life. I recommend purchasing the Source Nail portable e-nail from this preferred online retailer. I do receive a small commission if you purchase through my links, but rest assured that this has no bearing on the information presented in my reviews. I purchased a Source Nail largely based on your review. I loved using my Source Nail for four days, when it quit working. After powering ON, seeing HELLO, and then System:ON, followed by New Atomizer, Init Res:NO, I select YES, and hit power button to select, and then, . . . , Check Res !, Init Failed. Do you have any troubleshooting suggestions ? Very glad to hear that you are enjoying the Source Nail, best darn portable e-nail out there! I have seen this before when using mine and have found that removing the atomizer and reconnecting it often resolves the problem. If that doesn’t work for you, get in touch with Source directly at support@SOURCEvapes.com and they will be able to help. Great customer service! Hey David did they ever help you out, mine is doing that too.